When thinking of purchasing any type of railing, powder coating is an important consideration to think about. 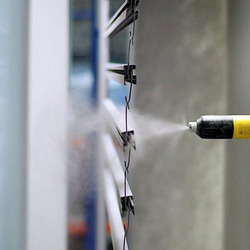 So what is powder coating? And why should you consider it? Paint might seem the best option if you thinking about coloring your rails, however powder coating last longer compared to it. It not only gives a smoother finish compared to brush strokes but also your coating will remain intact whether on rain or heat. Also with correct maintenance, powder coating can stay for 20 years or more. And if you also looking for an environmental friendly option, powder coating is the choice for you! Powders can be used immediately; they require no mixing or preparations as paints, catalysts and other solvents do hence if you looking to save time this is the best way for you to go! There are no fire risks associated with powder coating as compared to solvents and so their associated fire risk is minimal. This in turn means reduced costs which would have otherwise incurred in terms of replacing statutory features and insurance if there were to be a fire outbreak. With powder coating there is hardly wastage like in solvents. Solvents are made up of up to 70% of conventional liquids which are highly volatile; this means during application a significant percentage is lost to the atmosphere posing possible dangers. Also since they are normally unrecoverable, more solvent eventually ends up being used to polish the railing than if powder was used additionally powders are also intact making them environmental friendly . No powder need escape, any extra is recoverable which is great news because it means less air pollution!